in the entry of the Brandon Auditorium. checking out old graduation pictures. in the upstairs room of the Brandon History Center. Millerville history pictures in the stairway. Gary Buse and Fritz Loeffler looking over the military uniforms. Jeanette McGillicuddy won this Historical Brandon History Quilt at the Quasquicentennal celebration in 2006. She is shown here donating the quilt back to the Brandon History Center. We are very thankful for this donation. The quilt was displayed at the Brandon Auditorium during the Summer Fest on August 2nd and admired by many. in the main floor history room. Joanne Loeffler, Marcia Bolin of the history center, Bob Jones, Annette Suchy, Molly Buse, Maynard Peterson, Barb Pladson, Gary Buse, Jeanette McGillcuddy, and Lynn Rossum going through some of our many history books. John Roers, Mary Ann Roers, Maynard Peterson Jeanette McGillicuddy and Karen Thoennes looking over many of the antiques displayed at the Brandon History Center. Gareth Klimek, John Suchy, Gary Buse and Bob Thoennes. 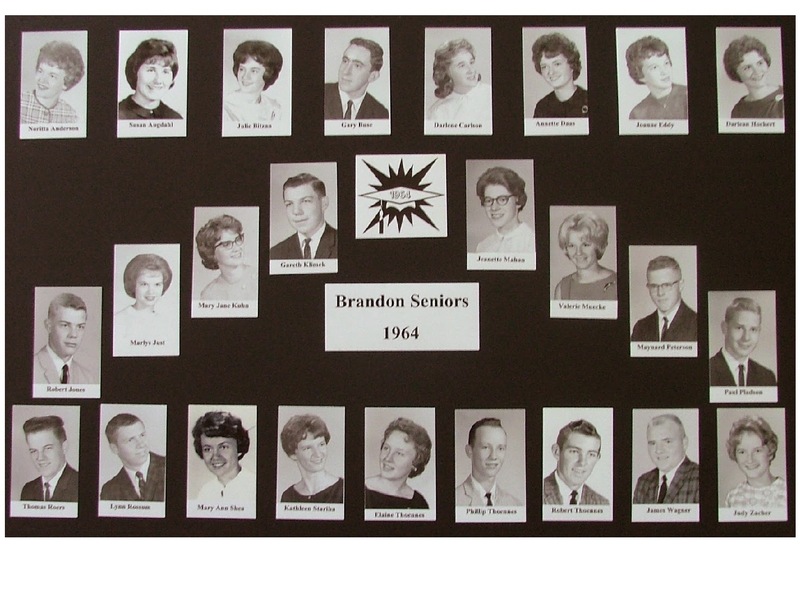 looking over Brandon history picture. Molly and Gary Buse and checking out more history books. off what we have collected. You can contact any of our Board Members to set up a time for your visit.